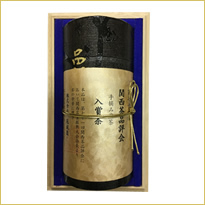 This is the winner in the 71st Hand-rubbed Sencha Competition in Kansai where held in Mie Prefecture Tu city at Synthesize Culture Center in 9th September 2018. There are 206 sencha exhibits in this year. 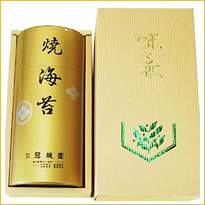 Our company successfully buy Awarded Hand-rubbed sencha. 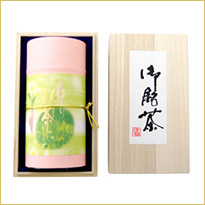 This hand-rubbed sencha is made by Mr.Sadahiro Yasue in Shirakawa Town in Gifu prefecture. Good and beautiful Hand-rubbed sencha. Participation in the competition starts from fertilizing the soil,Paying special care for their honor. First, the farmers enrich the soil with organic fertilizer. After two years, when the soil has become rich enough, they plant cuttings. They rear the plants for about three years. When young leaves sprout, they pick the leaves. 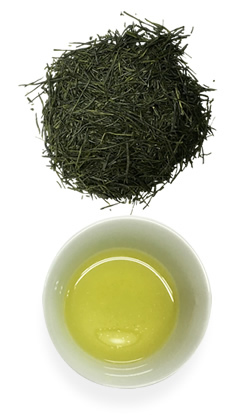 Freshness is one of the most important factors for the taste of green tea. Dozens of veteran farmers pick the leaves in the shortest time and the leaves are steamed as soon as possible. The experts rub the steamed leaves to dry. This product scored 196 points in all four categories. Brew it at lower temperatures (70℃). 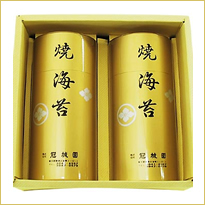 It gives water a golden color, which is peculiar to hand-rubbed tea leaves, a thick, sweet aftertaste, and the delightful strong aroma of a tea. Just one sip gives a sense of satisfaction. This is a blissful tea. 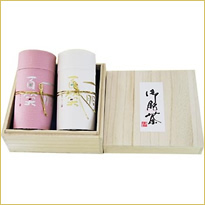 This tea is recommended for the gift and when you want to be satisfied tea taste. 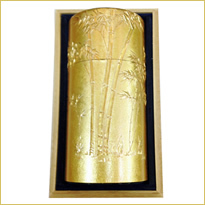 Drew neat bamboo on the gold color face.This is nice high quaryty can. The craftsman now remains few and this is valuable gold workmanship. Tea leaves of the highest grade grown in the hinterland of Kawane. Tightly curled leaves of deep color. Brew it in the lower temperature. Thick and sweet, but slightly bitter. You will enjoy rich aftertaste and aroma. Enjoy it in the most important occasion. Note that you should use hot water of the temperature lower than usual. 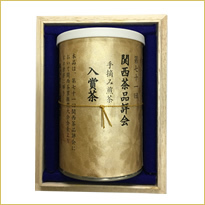 The contents is"hathuthumi" and "magokoro", both our most popular Sencha.The message on the canister says, "When you have this tea, you will be happy and want to laugh a hundred times." We can assure you that you will be content with this tea. 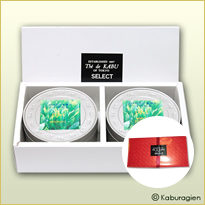 The contents is "hathuthumi", our most popular Sencha. The message on the canister says, "When you have this tea, you will be happy and want to laugh a hundred times." We can assure you that you will be content with this tea. 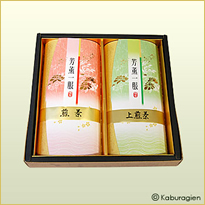 High quality sencha Megokoro is made by blending high aroma and middle steamed tea in Uji region with deep steamed tea in Kawane region and deep steamed tea in Kakegawa region. 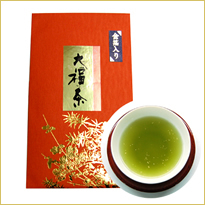 High quality sencha Hekiro is middle steamed tea in Kakegawa region. 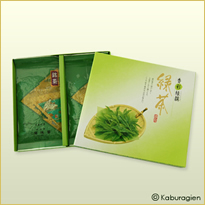 Both tea has beautiful green color, high aroma, and deep taste sencha and its set is easy brewing and it is suitable fro gift. A blend of about twenty-five kinds of tea leaves from various parts of the country. Mildly steamed Sencha. This is produced only by our company, with suppliers throughout the country. No special care is required to make good tea. The color is a beautiful green. Good for serving to guests or for your own enjoyment. Casual and useful, this isour most popular product. High grade deep steamed tea and mixed Matcha and adds gilt. Made it to be able to brew the gilt with tea through tight inner net of the kyusu(the Japanese tea pot).Amazing green color and gilt is brilliantly on the tea, gorgeous and good topic of conversation. It is good for little something to gift and Season's gift. [2017 new season Crop]It used mouth-melting Amo Nori. 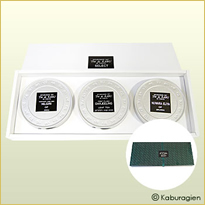 December is the best season for Nori.The perfect choice for gift. [2017 new season Crop]The Nori has sea-dried nice aroma specialized in new season laver and good taste that produced by "Norisibi" method. finished the highest quality Nori of the sea near Ariake.The Nori cut clearly in your mouth and has good taste and aroma of traditionally Japanese. The Nori is a pleased gift. 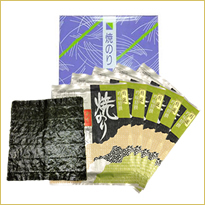 [2017 new season Crop]Hirayaki-Nori can be used for many purposes from sushi, soup, nabe dishes to salad. Hirayaki-Nori is harvested in Ariake Bay where it has been known as the most suitable environment for growing Nori. This set of Nori will exceed your expectations. The first-picked Darjeeling, DJ-1, is best known as the most highly praised tea, and 1 stands for being picked 1st day of spring.The perfect combination of OP tea, characterized by freshness and sweetness, and White tea, elegant flavor, makes this tea packs irresistible. It is directly transferred from the Poosbong Tea Garden at 7000 feet. 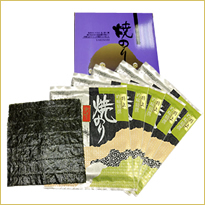 Hirayaki-Nori can be used for many purposes from sushi, soup, nabe dishes to salad. Hirayaki-Nori is harvested in Ariake Bay where it has been known as the most suitable environment for growing Nori. This set of Nori will exceed your expectations.